This incredible recently remodeled ranch style home is located on 100 acres of private wooded property and has several hundred feet of lakeshore on Sunset Lake. The home and property work great for corporate retreats, off site meetings or family reunions. 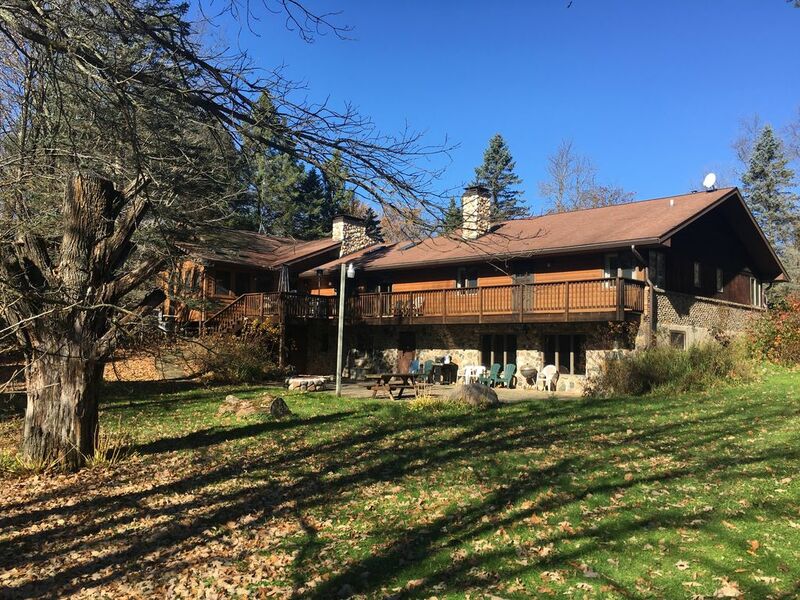 The house is set back from the lake in a totally secluded area looking out over a large back yard surrounded by thousands of mature pine trees. There are 3-4 miles of private trails through the woods, fields and marshes. Walk up to the field at dusk and you will likely see deer feeding on the grass. At night you will hear the loons calling. It's about a 100 yard short walk to the lake and private dock that can be accessed via driveway or backyard trail. In the summer months, the lake can be difficult to see through the trees from the house. The home is approx. 8,000 sq/ft and has 3 fireplaces, a large fully equipped kitchen, screened in porch with ceiling fan, large deck, family room, and a great room with a gas fireplace, dining area, huge leather sectional, computer with Wireless Internet access, wide screen digital TV, satellite receiver, stereo, CD, VCR and DVD players. There is a large finished basement with a wet bar, ping pong, bumper pool and fooseball tables, sauna and large stone fireplace. Walk out the basement to a large patio and fire pit. Within 10-15 minutes you can be golfing or dining at Ruttgers Bay Lake Resort, or fishing on Lake Mille Lacs, one of the best Walleye lakes in the country. There are several other restaurants and golf courses in the area as well as dozens of good fishing lakes, including Sunset Lake, which is great for Bass and Northern Pike. There is a 14' fishing boat and motor at the dock for your use and a pontoon for an additional cost. The quiet lake is great for water skiing and boating. There is a boat landing if you choose to bring or rent your own boat or personal watercraft. In the winter months the property works great for snowmobiling, ice fishing and cross country skiing. There is a full-time caretaker that lives on the properly in a separate house who is available to answer any questions during your stay. He stays to himself unless needed. Our home is 5 miles from Rutgers Bay Lake resort that offers public golf and dining on Bay Lake.